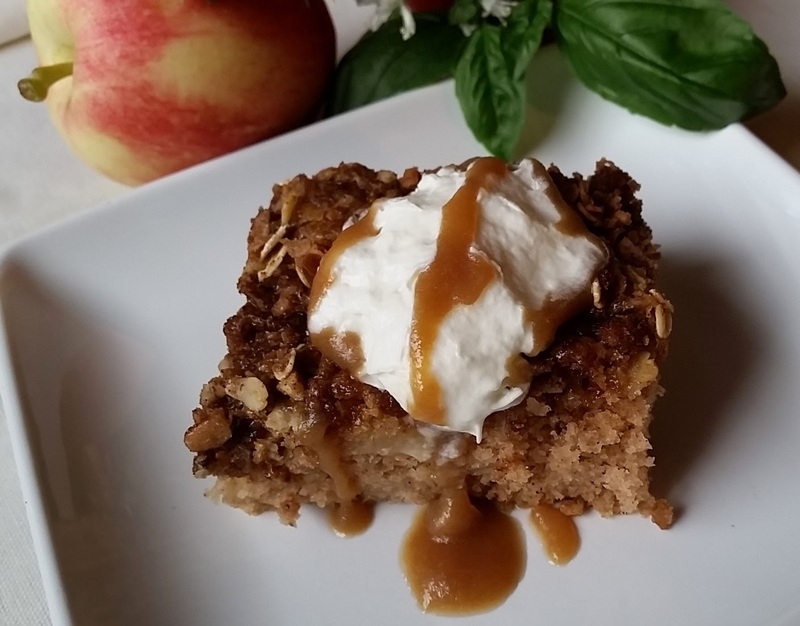 For Flashback Friday I am re-introducing this Autumn Apple Cake. It is the season when apples are available fresh from the orchards. This is a very moist cake, a recipe from my sister in law. There are so many varieties of apples in the store and in our backyards right now. I think any kind of apple will do. This cake smells wonderful as it is baking and your kitchen will be filled with wonderful aromas. For dessert hubby and I enjoyed a piece of this cake with a dollop of whipped cream and a drizzle of caramel sauce. So delicious. 1/3 cup nuts, chopped, I used pecans. Cream together butter and sugar. Add eggs, and vanilla and beat until well blended. Stir in dry ingredients alternately with buttermilk. Fold in chopped apples and nuts. Pour into a 9" by 13" greased pan and sprinkle topping over cake. Bake in a 350º oven for 40 minutes. Cool, serve with whipped topping and a drizzle of caramel sauce if you like. Crumble ingredients together and sprinkle evenly over cake batter. oh my goodness....look at THAT goodness. My kind of cake Betty....I am glad I conjur up thots of food...cake and coffee and friendship. Wonderful. And just in time for autumn's bounty of apples. Thanks for the post. You KNOW I am going to be trying your cake...even if I have to make it myself...half way across Canada! Betty, you and I must have been on the same page today. I was also in the mood for just baking a nice autum kind of simple cake in a pan. Maybe I'll post it soon. Next time I will try yours. i thought i could smell that from here...smile...did you say come over to your house instead of going out...lol. i will definatly be trying this, simple and delish, my kind of dessert! Oh I bet the house smelled wonderful. I was in the back yard looking at our apples. . .and soon I'll be baking with apples too. Apple cake is one of my favorites...wish I had a piece for afternoon coffee break! I have been lurking around your site for months now and have been enjoying all the recipes. Reminds me of my mom's cooking. This one I will have to try this weekend. Looks so yummy! I am enjoying your blog. I have been checking out a few of the recipes. I printed your biscuits and this cake. Both sound delicious! I plan to make a trip to an apple orchard in a few weeks so I will have to remember to try this cake recipe. This was a yummy cake; thanks for sharing the recipe. I was concerned that i didn't have the right size pan but it turned out fine in a 9x13 pan. Thanks again. I'm loving these Flashbacks - this one sounds especially wonderful and perfect for this time of year. I've been craving an apple cake - thanks for sharing the recipe! I have been looking for a ( wonderful ) apple cake to try. I think I have found one. Thank you. couldnt resist your autumn apple cake,but i made it using bobs red mill glutenfree flour.turned out great and tastes even better!!! Keep on coming with the flashbacks...they're wonderful and not only bring back great recipes but great memories to go with them. Thank you! I made this cake for company last evening and it was enjoyed by all. I served it with the whip cream and caramel sauce as pictured. Hubby and I had a piece for breakfast this morning as well. Does not need any tweaks!